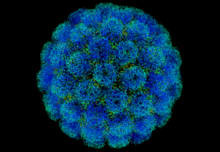 Viruses are much smaller than other living things like bacteria. Viruses are not alive. They do not do all of the things that living things do. They can only make more copies of themselves when they are inside living cells. Viruses often kill cells. many diseases are caused by viruses. This page was last edited on 14 October 2009, at 01:57.